I was pleasantly surprised by the picture that is produced by W1070. The device secures Full HD 3D 1080p image projection. I enjoyed its vivid and sharp colors. While testing, the displayed picture was clear and I didn’t notice any obvious distortions. 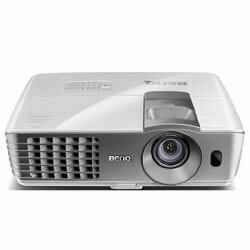 The projector is equipped with 2000 ANSI lumens that provide the necessary brightness and contribute to the higher quality of the picture. BenQ allows watching Full HD movies, TV shows, and sports, as well as playing action-packed video games on a screen 200-inch in diagonal in literary any room, which suits for this purpose. ‎BenQ W1070 is equipped with the SmartEco technology that allows saving energy and guarantees longer lamp life, which will last up to 6000 hours. This model costs cheaper compared with the devices with similar features. 3D content support enriches its entertainment capabilities. The projector isn’t equipped with a vertical keystone so it’s necessary to keep it exactly in front of the screen. The picture of Optoma HD27 versus BenQ W1070 is more impressive. First, it provides a bigger throw ratio range. Second, it’s equipped with 3200 ANSI lumens, which secure really excellent brightness. The colors look even more realistic, crisp, and saturated. This projector displays a truly life-like picture. Additionally, it has an advanced optical lens that ensures highly detailed images. ‎Optoma HD27 is lightweight and portable. The projector is perfect not only for indoor but also outdoor viewing. A picture on a dark wall is equally good to the picture projected on a screen. The device has a pretty limited zoom ratio. Optoma HD27 is a decent home theatre projector that can perfectly satisfy one’s requirements for the high-quality picture. 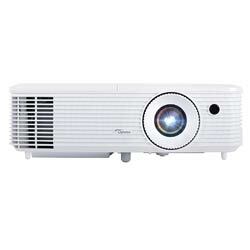 If you don’t have many demands to the projector’s sound, then Optoma HD27 built-in 10W mono speakers will suit you. In general, the device’s well-featured, and the combination of all its specs guarantees an outstanding viewing experience. Compared with Optoma HD27, BenQ W1070 offers a bigger 1.3x zoom and contrast ratio (25,000:1 versus 10,000:1). Although it’s equipped with a more powerful 240W lamp, its life is shorter, up to 5,000 hours in eco mode and 3,500 hours in normal mode. Meanwhile, Optoma HD27 secures 5,000 hours of operating in normal mode. Also, BenQ is a bit louder than Optoma. Nevertheless, the audible noise level is very low, and neither of the models prevents from comfortable watching.